On Sunday, star Missouri football player Michael Sam announced he was gay. The All-America defensive end – who is projected to be a 2nd or 3rd-round pick in the NFL draft – could become the first openly gay player in America's most popular sport. 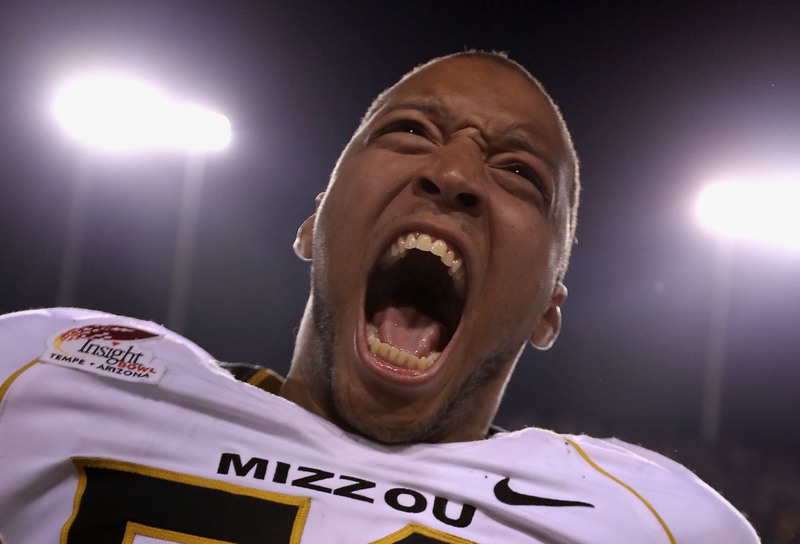 Sam, the SEC Defensive Player of the Year, said his teammates and coaches at Missouri were all supportive when he came out to them in August.Will NFL players be welcoming? "Hopefully it will be the same like my locker room," he told ESPN. It remains to be seen how he will be received in NFL locker rooms but some current and former players took to Twitter to voice support for Sam. Had multiple convos with @MikeSamFootball this year, amazed at his honesty & courage! Once a tiger, ALWAYS a Tiger! I could care less about a man's sexual preference! i care about winning games and being respectful in the locker room! I applaud Missouri DE @MichaelSamfootball for his bravery & honesty about who he is. I pray he gets a opportunity 2 play the game he loves! Great courage by SEC Def POY...It's time for the NFL to show it's colors!⚡️"NFL Prospect Michael Sam Comes Out http://t.co/HRKzwUeS2M"
Wow! Huge news out of Missouri! Good for Michael Sam, a brave move. A handful of players have previously stated that they would be uncomfortable with a gay man in the locker room, including New Orleans Saints linebacker Jonathan Vilma. “Imagine if he’s the guy next to me, and you know, I get dressed, naked, taking a shower, the whole nine, and it just so happens he looks at me, how am I supposed to respond?” Vilma told the NFL Network in an interview last week. James Brown, the host of "The NFL Today" on CBS Sports and a CBS News special correspondent, said Vilma is "not in the minority with respect to that attitude." "That will be the kind of environment by and large that Mr. Sam, if he makes a team, will be walking into,” said Brown. “A very macho environment, testosterone laden and players will be looking with raised eyebrows, by and large, for sure." CBSSports.com senior NFL columnist Pete Prisco asked a handful of NFL players last year how they think a gay player would be received in the locker room. Prisco said the reactions were mixed but the bottom line is a star would be welcomed much easier than a backup. "If Sam can get 15 sacks, nobody will care because he would be essential," Prisco writes. "If he's a special teams player, it might be harder, based on what the players told me."